I can’t say I wasn’t warned. All of the press about Eataly, the new large-scale gourmet food shop (owned by Mario Batali, Joe Bastianich, and Lidia Bastianich, with Italian founder Oscar Farinetti) has warned of the crowds. Still, on a recent visit I was somehow surprised to see a line of people coming out of the store. Once inside, things weren’t much better. Mobs of people everywhere. Mobs in line to buy cheeses. Mobs in line to eat. Mobs, mobs, mobs. This was overwhelming. Nowhere to sit down to eat. No one to ask where to order. Being in Eataly felt like being in the wild West. My best moments in Eataly were in three low-key and less busy areas. The first was the fish market. 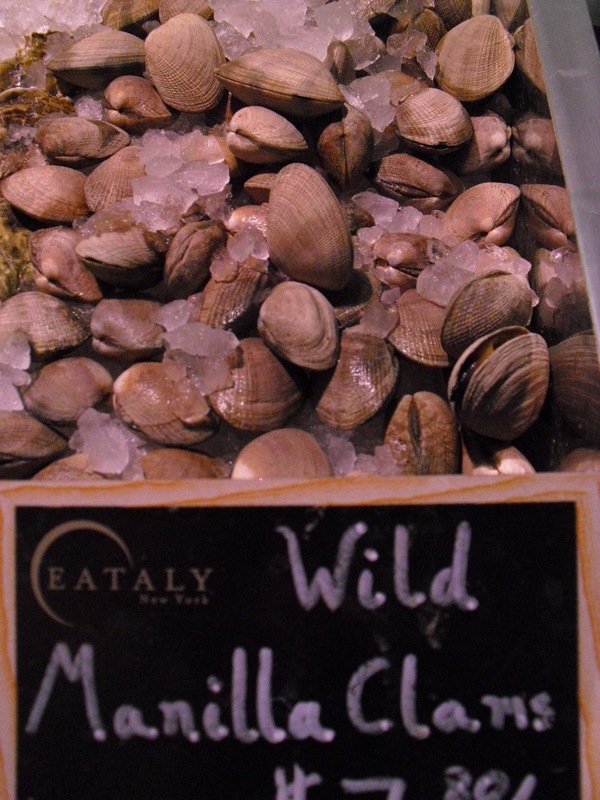 There I came across a wonderful prize: very small manilla clams about an inch and a half in diameter, much smaller than the little neck clams one finds in most markets. By Italian standards, the US littlenecks are too large and tough for most dishes, and I’ve always found working with them frustrating. The tiny manilla clams sold at Eataly offer an excellent way to reproduce Italian dishes such as spaghetti alle vongele, and I’m excited about working with them. The second really exciting section was the olive oil department, organized by Italian region. Whereas helpful staff seemed non-existent in most parts of the store, I was immediately greeted here by a gentleman offering me three oils to taste. The man knew his material and was able to walk me through not only the three oils I tasted, but several others I inquired about as well. Although other stores and on-line merchants offer similar products, the level of customer service in this department would bring me back for sure. A third reason I would return to Eataly is the imported Italian craft beer selection. If there are others importing small-scale Italian beers, I haven’t found them. Although the selection is not vast, and once again I was unable to find anyone to help me, it offers a unique chance to dabble in the exploding Italian micro-brew scene. Ironically, Joe Bastianich himself was close by checking inventory in another department, but I was too bashful to demand his attention. Overall, I would avoid Eataly as much as possible until the crowds die down. Although Eataly was conceived and first opened by Italian Oscar Farinetti in Turino, I can’t help feeling that the concept does violence to the norm of Italian shopping and dining: small and personal. Whatever its origins, it seems thoroughly American in its desire to package and market an experience. It’s sort of cool to have Italian news on the tvs and Italian newspapers for sale, but in the end this just seems part of the gimmick. The fact that one might soon open in Rome makes me a little queasy. Perhaps NYC can use an Eataly, but why in God’s name does Rome need one? Very odd and very disturbing. 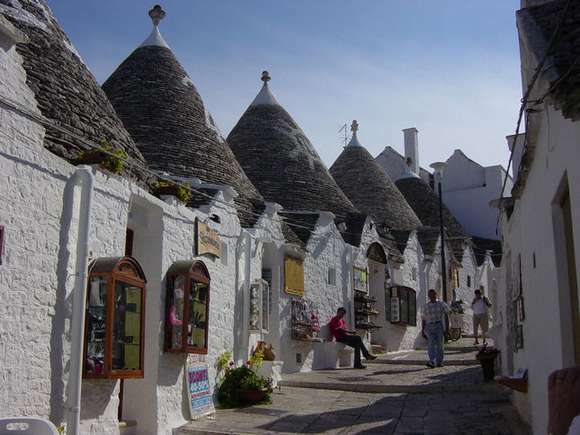 After my mixed experience at Eataly (part deep gratification, part horror) I was relieved and comforted to enjoy a quick meal just a few blocks away at the bar of the excellent restaurant I Trulli, dedicated to the cooking of Puglia and named for the distinctive cone-shaped dwellings typical of that region. This quiet, lovely restaurant felt a world apart from the bustle and mayhem of Eataly. As one of the only restaurants in the US dedicated to the cooking of Puglia, I Trulli is a real gem, particularly the pastas made there by Puglia native Dora Marzovilla in conjunction with chef Patti Jackson and her staff. Although I didn’t have time to enjoy a proper meal, I did enjoy a wonderful first course: potato and swiss chard gnocchi sauced with pork cheek ragu. It was simply divine and made me rue inadequate time to continue with the menu. Another highlight was a bit of house-made goat’s milk ricotta accompanying the focaccia I was served. A splendid idea, one traditional to Puglia I presume. The wine list is excellent, the staff knowledgeable, professional, and friendly, and the menu compelling. Being at I Trulli felt far more like being in Italy than shopping in Eataly did, and I’m looking forward to a return visit soon! i use the Beer Menus site to look for Italian craft beer in NYC. hope it helps so you dont have to deal with the Eataly crowds for a good Italian brew!